See some of our launch photos in the Garbee Gallery, and on Bdale's Flickr Photostream. We have family memberships in (and regularly enjoy flying our models with!) local clubs Tripoli Colorado, SCORE, and NCR. We have also flown with ARS, COSROCS, Kloudbusters, Metra, NRVR, NZRA, and QRS. Apogee Components is a local company. Perhaps best known as the place to get the RockSim rocket design and simulation software (which we wish came in a Linux version! ), we've also bought lots of parts from them for building rockets from scratch, and we really like some of the Dynastar mid-power kits like the Rip-Roar and Sky Torpedo. Apogee is also a distributor of our TeleMetrum starter kits! 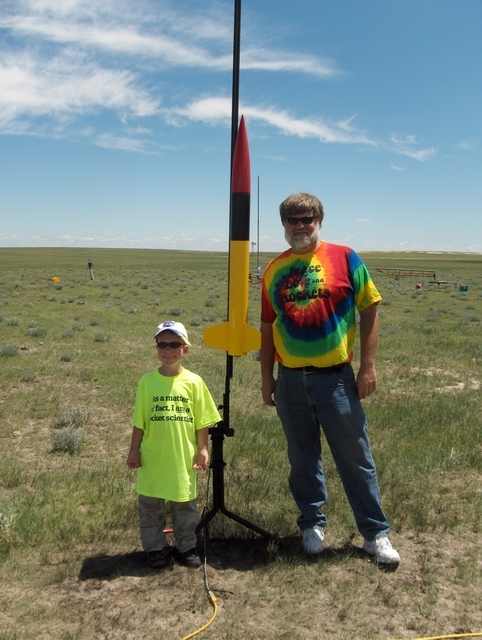 Giant Leap Rocketry is a great source for components for building high power rockets. We particularly like the Pinnacle nose cone series, and DynaWind pre-glassed airframe tubing. Local rep Joe Hinton shows up at various launches we attend, and gets most of our commercial motor reload business. What's Up Hobbies is the home of the Polecat Aerospace line of kits, plus Jack carries a lot of other useful bits and pieces. Public Missiles make very nice parachutes and HAMR retainers, which are our favorite retainers for 29-54mm motors. Aero Pack makes the flanged motor retainers we like the large projects that contain 75 and 98mm motor mounts. Chris' Rocket Supplies handled a problem caused by one of their suppliers with an order brilliantly, and will get more of our business in the future. Discount Rocketry used to consistently have the best prices on kits and motors, but recently has seemed to be mostly out of stock on things we want. We've bought lots of Estes motors, smaller Aerotech reloads, and Rouse-Tech cases from them. And they're responsive and helpful on the phone, so we'll happily buy things from them that are in stock. Lots of people make electronics for use in hobby rockets. This is a brief list of only the things we've actually used ourselves. First off, Bdale and friends develop fully open hardware and software designs for rocketry avionics, under the name Altus Metrum. We also fly commercial altimeters in some projects. The cheapest off the shelf altimeter we've used and often recommend to beginners is the Missile Works RRC2-mini. At about $80, it gets the job done for simple barometric control of dual deployment. Note that while early versions had a firmware bug that we believe is at least partially responsible for Bdale's loss of his first L3 project, recent versions seem fine. For another $20, the PerfectFlite miniAlt/WD adds the ability to records the barometric flight altitude profile. Both of Bdale's L3 certs flew with one each of these two commercial altimeters, and we often use the MAWD as a backup for our TeleMetrum units during test flights. The BeeLine TX boards from Big Red Bee are radio tracking transmitters that just work. They require an amateur radio license, but we think anyone flying big rockets can and should get one of those anyway! While a lot of great information is available on the web, there are some paper books that we've found very helpful at various stages. Handbook of Model Rocketry, 7th Edition (NAR Official Handbook) may be the best first book on model rocketry. While the focus is on small rockets, the basic principles of static stability and construction covered here are important at all levels of the hobby. Modern High-Power Rocketry 2 covers a lot of material, and is a great resource if you're starting to think about a high power certification and don't have a club nearby, or just like to read about how other people have done things and why. Topics in Advanced Model Rocketry is definitely not for everyone, as it's heavy on math and isn't a "how to" book at all! But, if you really want to understand what's going on with higher performance models and/or inside the simulation software we use when designing rockets, the material here will take you a long way!